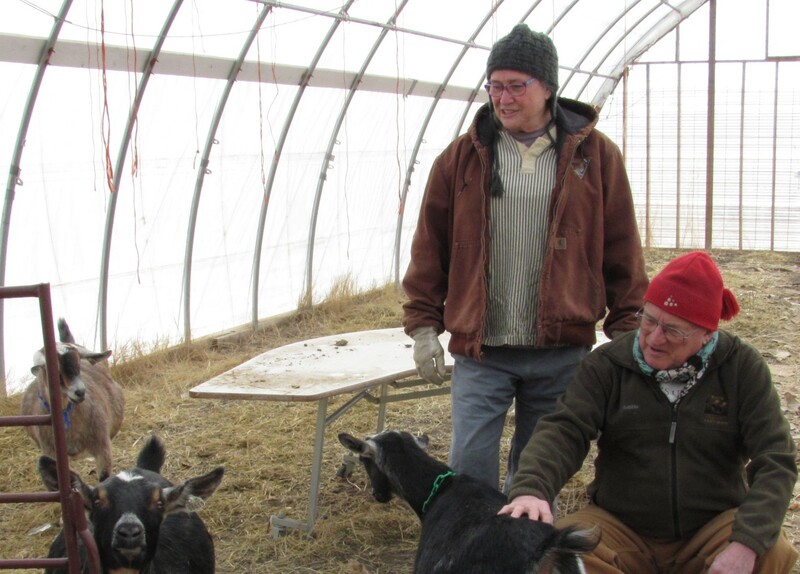 Jackie and Scott Taylor let their pregnant goats clean up last year’s high tunnel garden and fertilize for next year’s crops. Photo by Barb Gorges. Last year, I relinquished our small vegetable garden plot my husband, Mark, so he could experiment with all the new information he was learning as a Laramie County Master Gardener intern. I even refrained from harvesting any cute cherry tomatoes and popping them in my mouth when I walked by. This year, I want to grow vegetables again. This has me thinking about how gardeners work as partners. How do they split decisions and the maintenance? Before I learned to grow a tomato three years ago, it was easy: Mark grew our vegetables and I grew flowers. I’ve interviewed people from four partnerships to see how they work. Jennifer Wolfe and her sister, Gina John, own the house, now 100 years old, in which they grew up. Because its location is close to the Capitol, they decided to turn it into office rental space. Because the city requires a landscape design for commercial properties, their gardening decisions are based on those requirements. Jennifer, with her master gardener training, said they decided to make providing habitat for wildlife their objective, rather than waste money on lawn watering. So she and Gina have converted the space to mostly perennial flowers, with many of the plants contributed from their home gardens. You may have seen it on the Master Gardener Garden Walk in 2013. Because her sister is still working, Jennifer is the primary gardener. Gina comes sometimes comes in the evenings to help and seems to be in charge of adding garden art. Employees of the tenant, a health services company, appreciate the effort, often strolling the garden and opening windows to let the garden sounds and fragrances in. Jackie and Scott Taylor were in business together for 30 years before they became serious gardeners. Photo by Barb Gorges. A quick perusal of the Laramie County Master Gardeners directory shows there are 15 sets of people who share the same last name and address. Presumably they are couples in which both take a serious interest in gardening. One of these couples, Scott and Jackie Taylor, went so far as to take the advanced master gardener training recently. 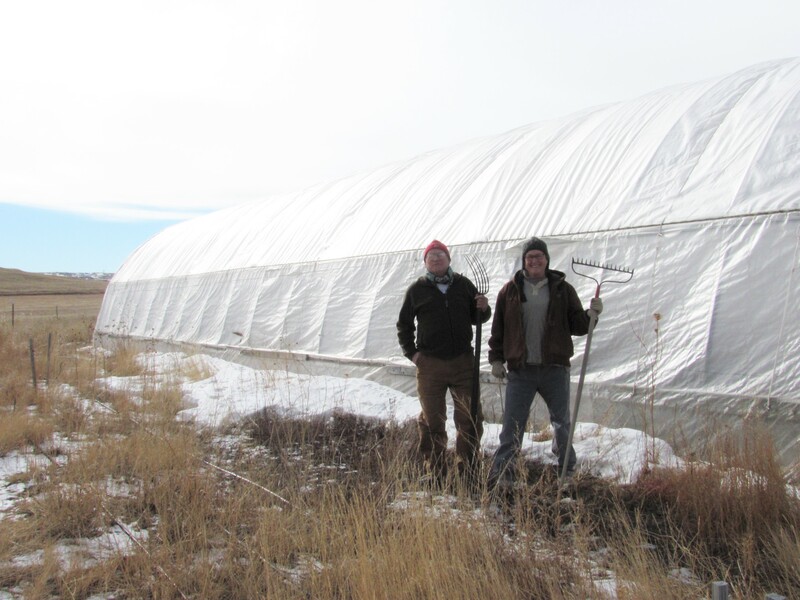 They are cultivating a serious amount of space–15,000 square feet–including two high tunnels and an orchard, plus raising livestock, west of town, near Gilchrist Elementary. You may have seen some of their harvest for sale at the Tuesday and winter farmers markets. In business together in Laramie for 30 years previously, they have learned how to disagree, come to a decision, and still be friends. “We start with seeds, look at plot space, and it’s invariably a big discussion and I want more than there is room for and Scott reins me in,” said Jackie. This is a fairly typical division of labor—one person is more attuned to the details of nurturing delicate plants. But Jackie, after weeding, will report on potential moisture level problems. And while the vegetables are a joint venture, “He’s more interested in the fruit trees and I’m more interested in the flowers,” said Jackie. They’ve been married 44 years, “going on 70,” one of them said. “It’s nice to enjoy the fruits of our labors together,” Jackie said. At a young age he was using his toy truck to move dirt in his mother’s garden. Now he, at age 11, and his mom, Carolyn, are newly fledged master gardeners. You might run into Riley at the Paul Smith Children’s Village where he volunteers. It was when he and his mom visited in 2011, shortly after moving to Cheyenne, that director Aaron Sommers began encouraging Riley’s interest in gardening. Last year, at home, out on the prairie west of town, his dad Reagan helped Riley build raised beds out of old shipping pallets and fence the deer out. Riley grows vegetables he promises to eat, such as peas. He and Carolyn have big plans for this year, hoping to do better. “We are just starting to do some flowers,” said Carolyn. Since there wasn’t time to install the automatic watering system, Riley helped out with hauling hoses. “We really didn’t have to weed that much,” he said, because raised beds aren’t very weedy. Jane Dorn spent years holding down the fort, garden-wise, while her husband, Robert, spent summers out in the field working as a professional botanist. Not that he wasn’t interested in what was growing and helping with the gardening—he’d worked in his uncle’s greenhouse when he was growing up. When Jane retired, the couple left Cheyenne and built a cozy house on acreage outside Lingle. Recently, they built a greenhouse over their vegetable patch. It has become Robert’s domain for experimenting with vegetable growing. He has begun to keep extensive records, the scientist in him unable to be suppressed. Now, when planning this year’s garden, Jane and Robert discuss the veggies: what has done well, what seeds are left over, what new varieties in the seed catalogs sound like they might do well. “We plant multiple varieties because some work better one year than another,” said Jane. They also discuss Jane’s native plant prospects. “I’m trying to grow native wildflowers,” Jane said. Robert helped her build a rabbit-proof fence. She and Robert are co-authors of “Growing Native Plants of the Rocky Mountain Area.” Jane will be speaking about growing natives at the Habitat Hero workshop March 28 sponsored by Laramie County Master Gardeners, Cheyenne Audubon and other organizations. Discerning what the native plant catalogs are offering, whether they are new improved varieties, or just renamed originals, and whether they will grow at their homestead makes use of Jane and Robert’s lifetime of expertise. Both Jane and Robert weed, though with raised beds there is not much to do. While Robert has drawn up the watering schedule for the drip irrigation system, Jane can also run it. Jane seems to have a knack for harvesting beans, and Robert takes great joy in bringing greens in from the greenhouse every night for dinner–all winter long. 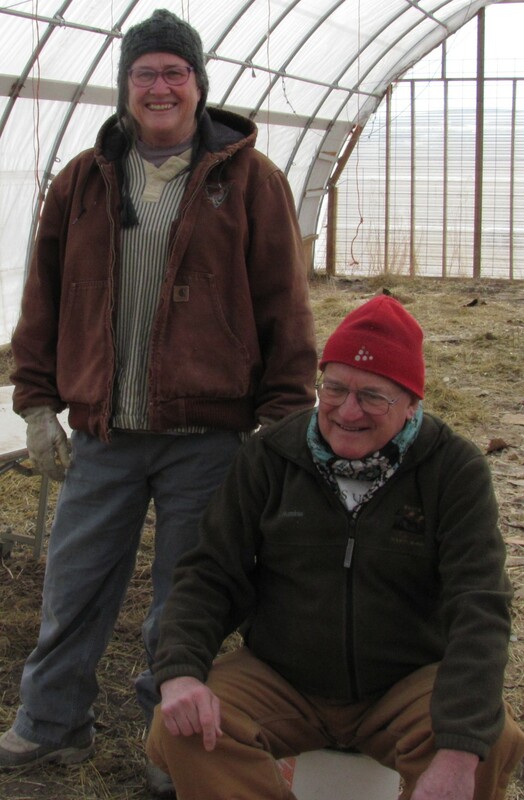 Scott and Jackie Taylor depend on two high tunnels to raise vegetables in southeastern Wyoming for local farmers markets. Photo by Barb Gorges. Categories: Gardener partnerships | Tags: Cheyenne, drip irrigation, family gardens, farmers market, gardener partnerships, gardening, gardening with children, gardening with kids, growing native plants, Habitat Hero, high tunnel, Jane Dorn, Laramie County Master Gardeners, native plants, native wildflowers, raised bed, Robert Dorn, vegetable gardening, Wyoming | Permalink.